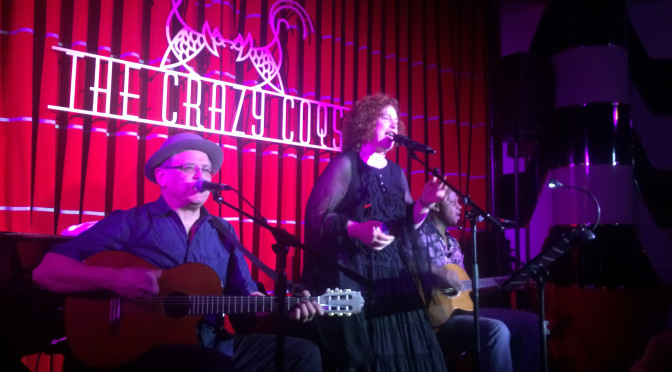 This was a magnificent return to Ronnie Scott's Jazz Club for Sarah Jane Morris with an uplifting set centered upon her latest work with longstanding collaborator Tony Rémy to deliver revelatory interpretations of the sublime songbook of John Martyn, with 'Couldn't love you more' a beguiling and soulful highlight of the first set. The sumptuous talents of her regular band of Tony Rémy (guitar), Henry Thomas (bass) Tim Cansfield (guitar), Martyn Barker (drums) were delightfully augmented by the special guest appearance of Dominic Miller, whose signature lithe and expressive counter-melodies illuminated many of the pieces, including an elegant and mournful take of his own 'Fragile' summoner's tale. Morris and Rémy's talent for reimagining the temper and tone of classic songs was perfectly exemplified on the arresting interpretation of 'Imagine', that transposed the detached idealism of Lennon's original into a forthright anthem on the plight and rights of the modern-day refugee. An utterly hypnotic 'Solid air' blew open the second set with the ethereal beginning of Martyn's lament to Nick Drake acquiring an almost transcendental groove as it shifted gears. A stately and gospel-tinged take on Dylan's 'I shall be released' prefaced a slightly incongruous, yet totally joyous 'Don't leave me this way'. Martyn's redemptive 'I don't know about evil' provided a captivating coda for a wonderful opening performance for Morris' three-night residency at this auspicious venue. A related five-track studio EP 'Sweet little mystery' is already available with a full-length album to follow www.sarahjanemorris.co.uk. 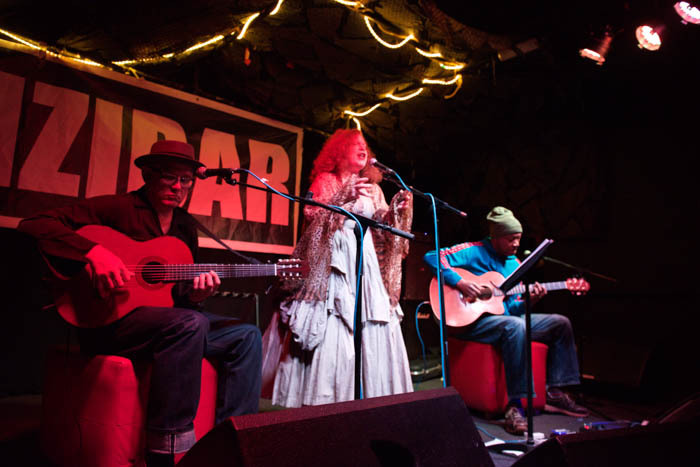 With her mellifluous delivery and four-octave range, Sarah Jane Morris could hum a contacts list and still dazzle. 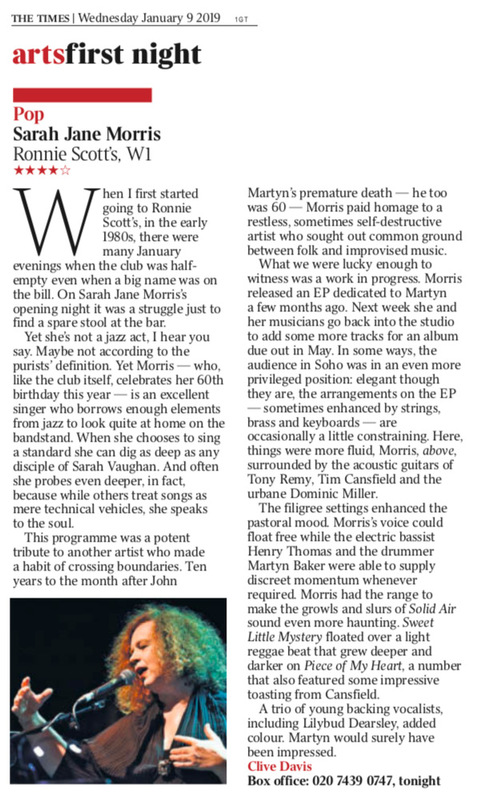 Little wonder, then, that her take on the music of John Martyn, the late singer/songwriter who straddled folk, blues, jazz and rock — as indeed does Morris — felt incandescent. “He was an outsider, a purveyor of truth,” she said, all red curls and swirling petticoats, introducing covers from forthcoming Martyn-inspired album Sweet Little Mystery. While songs such as Solid Air and Head and Heart retained their original hypnotic fragility, each came with new vocal embellishments that illuminated sentiments buried within and theatrical gestures that boldly acted them out. 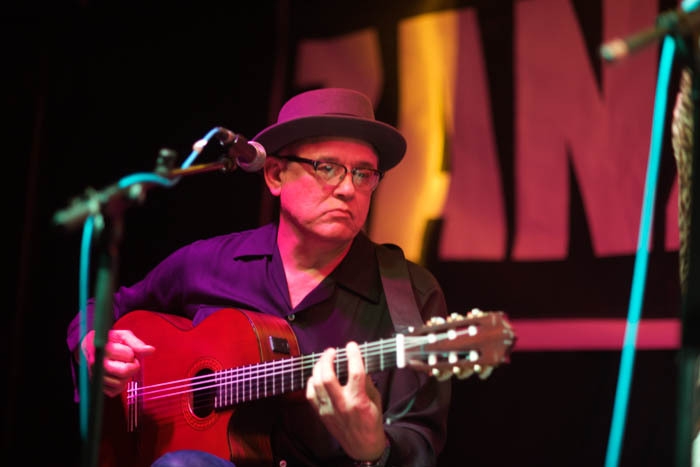 The musical line-up was similarly inspired: kit drums and four guitars including an acoustic wielded by longtime collaborator Tony Remy, a man “too cool to sweat”, grinned Morris. Elsewhere, a cover of Janis Joplin’s Piece of My Heart saw Morris in husky full throttle. Social issues loomed large; Morris spoke truth to power, calling for peace and understanding and lamenting Brexit, anecdotally and in song: Don’t Leave Me This Away, her 1986 smash disco hit with the Communards, and a rowdy singalong encore, has never felt more resonant. 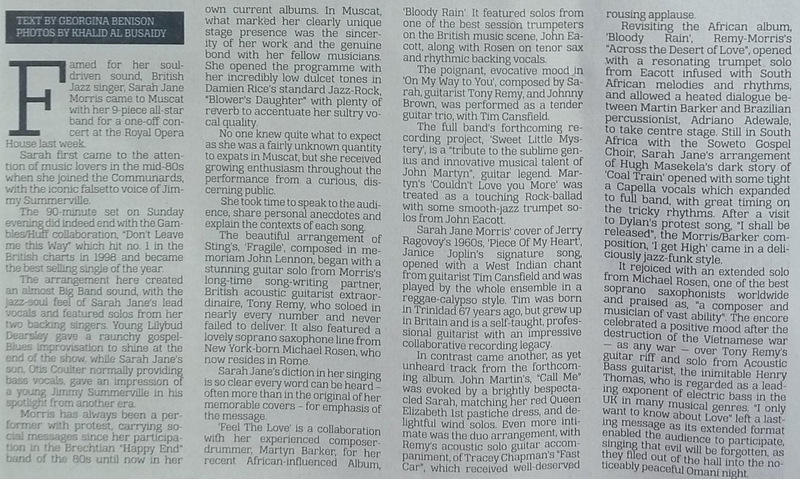 "..here she hits a career high with an album dedicated to Africa"
"..a transcendent mix of cold fury and compassion"
"Sarah-Jane Morris is in every sense an original voice... 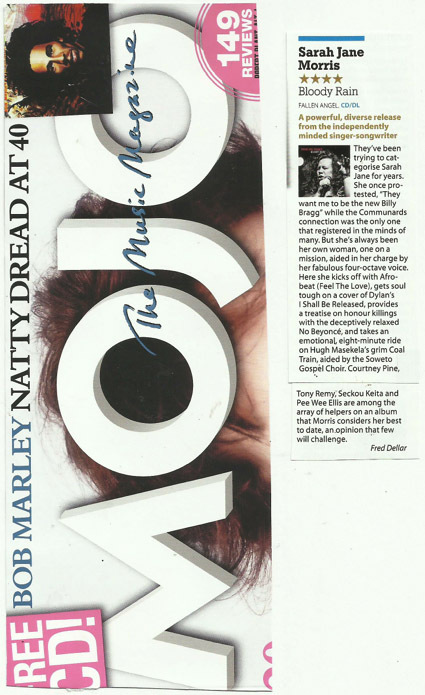 Her latest album... performed with a stellar ensemble of rock, soul and world musicians including Dominic Miller, Pee Wee Ellis, Seckou Keita and Courtney Pine, is all about Africa....it combines a visceral lyricism with intense moral and political engagement." 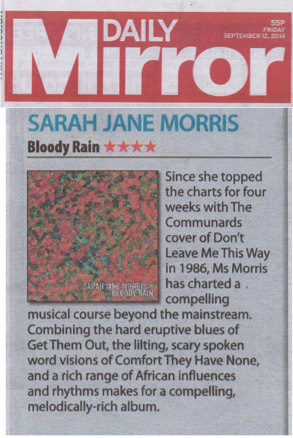 "...this is a remarkable album...for its ambition, its sound world, its powerful stories and, at its centre, the breathtaking range and timbral richness of Sarah Jane Morris's voice.."
"A powerful, diverse release......an album that Morris considers her best to date, an opinion that few will challenge." 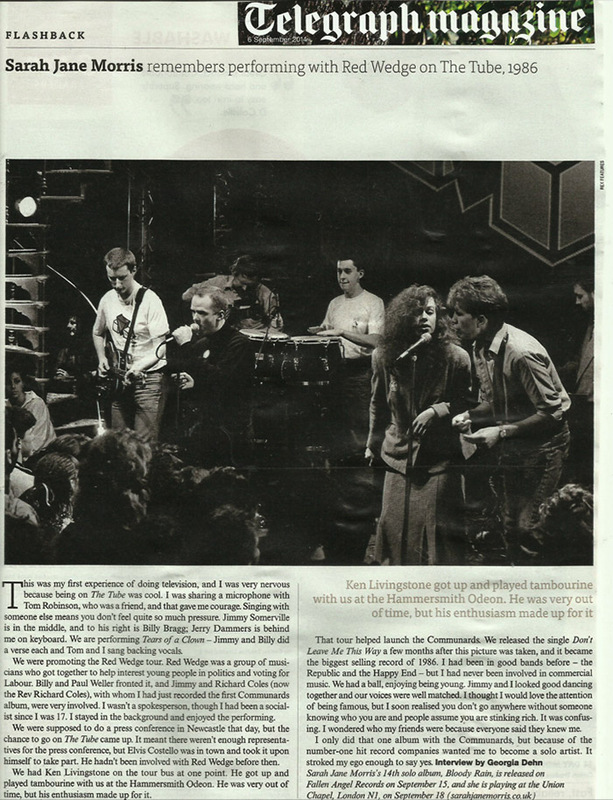 "..it packs a dramatic punch, often uplifting, occasionally harrowing, but always passionate and challenging." 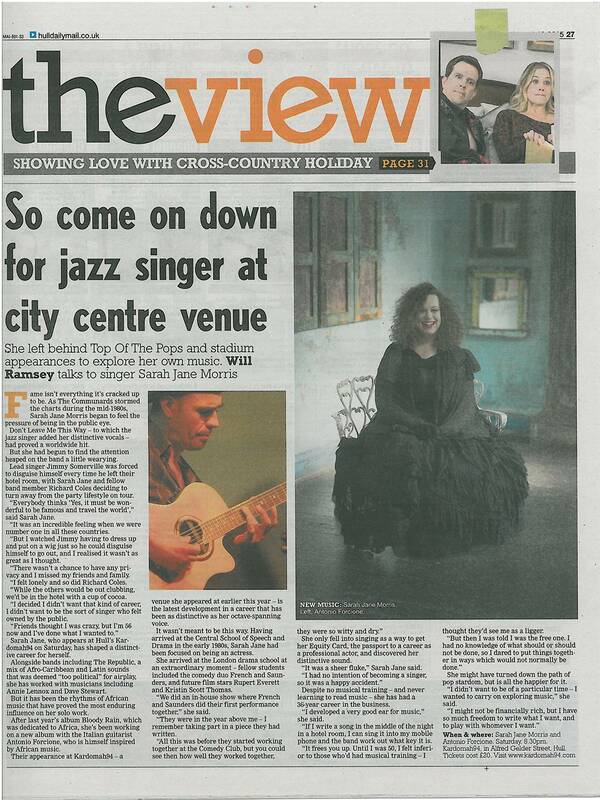 "Sarah-Jane Morris has kept excellent company during her illustrious career but with Bloody Rain, she excels herself.........Morris has enlisted some wonderful talents here: Courtney Pine on sax, the exuberant Zimbabwean singer Eska, the Soweto Gospel Choir, James Brown's right hand man Pee Wee Ellis, and so much more." "This...album combines great music and shocking themes to powerful effect." 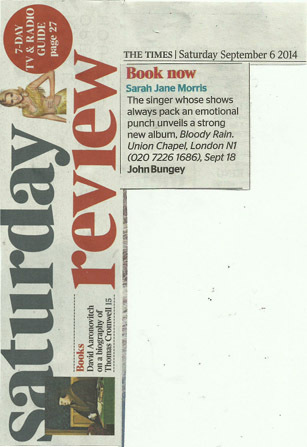 "Bloody Rain is the latest album from Sarah Jane Morris and it's an album that will make you weep and your spirits soar." 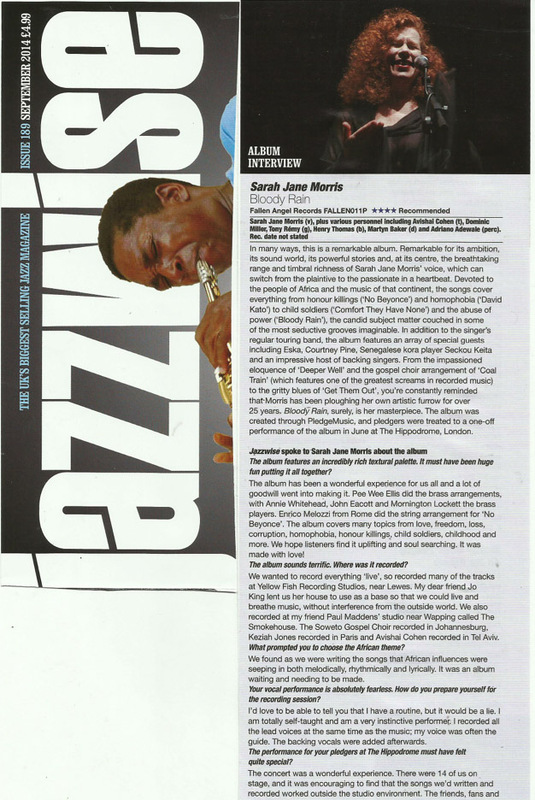 "Morris's deep husky voice is stunning.."
"..the singer whose shows always pack an emotional punch unveils a strong new album"
With her latest album Bloody Rain having garnered significant critical acclaim, Getintothis’ Paul Higham saw the light in Sarah Jane Morris’ African-inspired and jazz-inflected songs of social injustice. 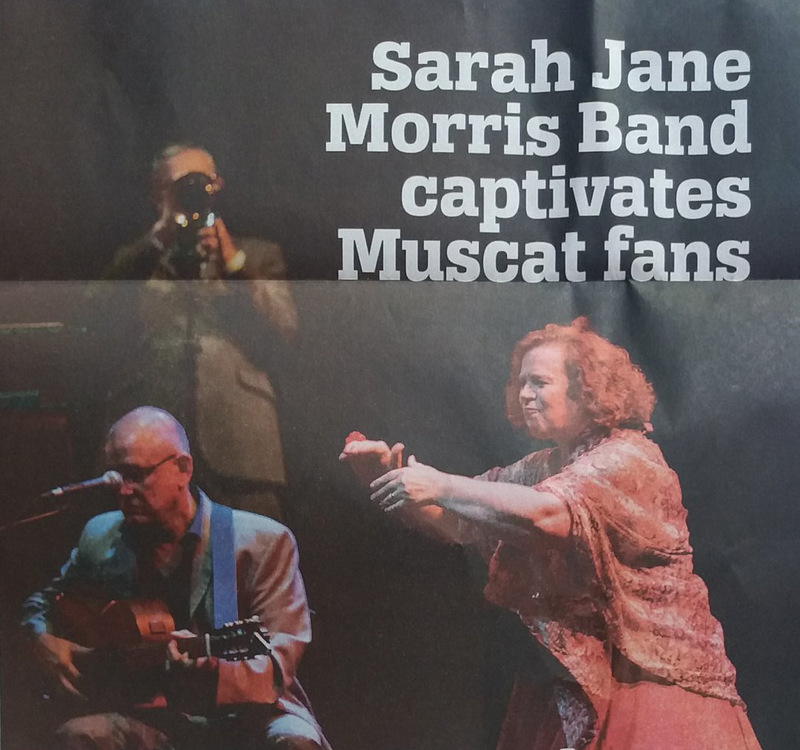 It is fair to say that Sarah Jane Morris has had an interesting and varied career. Beginning as singer in the early 1980s with London’s politically inspired outfit, The Republic, Morris found broader fame – and chart success – as a vocal foil to Jimmy Somerville in The Communards. Notoriety was assured as her 1989 solo single Me and Mrs Jones was banned by the BBC for its lesbian content. 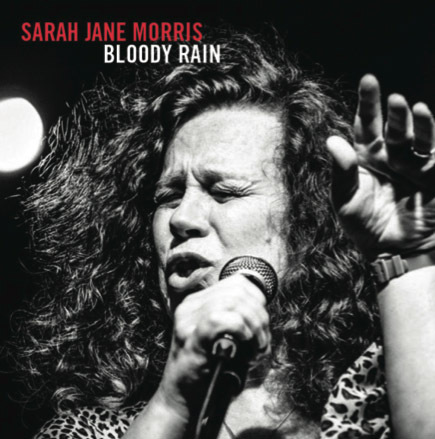 Bluesy singer Sarah-Jane Morris has kept excellent company during her illustrious career, but with Bloody Rain, she excels herself. This African-inspired crowd-funded album combines great music and shocking themes to powerful effect. (And it also raises money for SING, a charity raising funds for women and children affected by HIV and AIdS.) The titular song of Bloody Rain takes aim at political tyrannies; other themes include reproductive health (this with a calypso), child soldiers (written with the deeds of the Janjaweed militia and the Lord’s Resistance Army in mind) and homophobic violence. The last is given face by a song called simply ‘david Kato’ in furious memory of the murdered Ugandan activist. 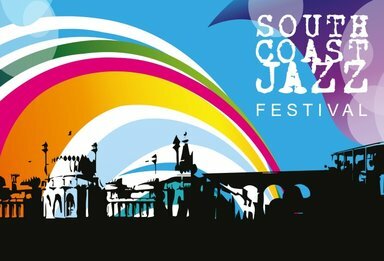 Morris has enlisted some wonderful talents here: Courtney Pine on sax, the exuberant Zimbabwean singer Eska, the Soweto Gospel Choir, James Brown’s right-hand man Pee Wee Ellis, and so much more. 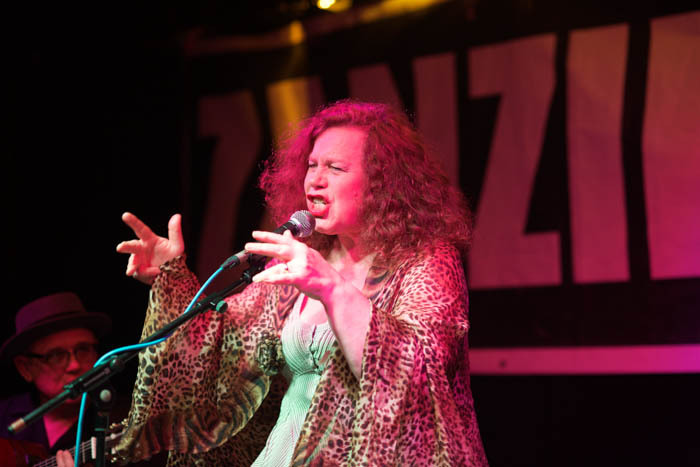 ....the whole show suggested that though Sarah Jane Morris has enjoyed some inspiring partnerships over the years, this latest incarnation with Forcione is already sounding like one of her best.